Over the last month, while learning how to play Republic to Empire, I have been working on some artillery accessories. 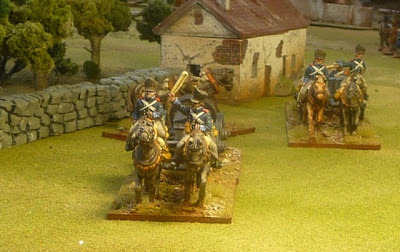 As I have done more wargaming, I have started to realise that moving troops about the field is complicated. One needs to recognise that artillery placements are much larger than the bases on which we mount our cannon. 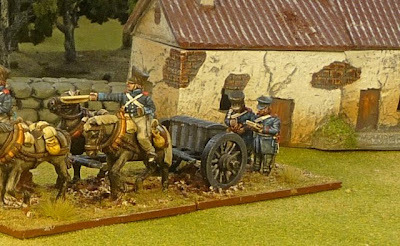 Barry Hilton in his rules (RtoE) discusses this and recommends the use of limbers and the like to fill up the space behind cannon. This seemed very reasonable so I bought various artillery elements. 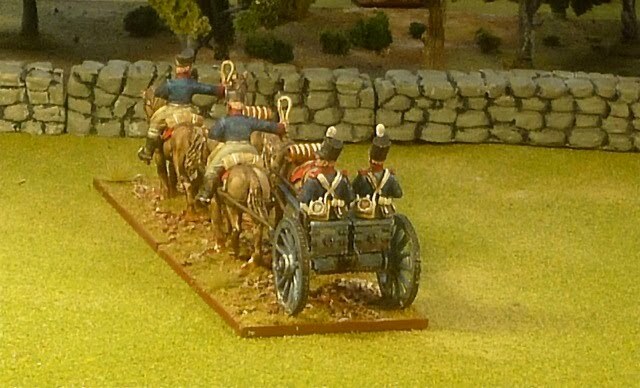 I have decided to use 50x80mm bases for all my artillery elements. Some of these groupings would require a 200mm long stand to base the entire element, I was a little uncomfortable with this as I felt it gave me less flexibility on the gaming table. I really do not like my figures to be too bright, I enjoy a more muted look. I find that my technique of white prime, with multiple thin washes with an occasional dry brushed highlight followed my some medium strength Army Painter is really working for me. This French limber is from the Front Rank collection. This is their 1807-12 version, I like the tall plumes. I am not sure if the light blue colour for the plumes, cuffs and collars is entirely accurate, but I like it. I believe I used Citadel Gretchen Green very thinned for the wood work. Nice set. 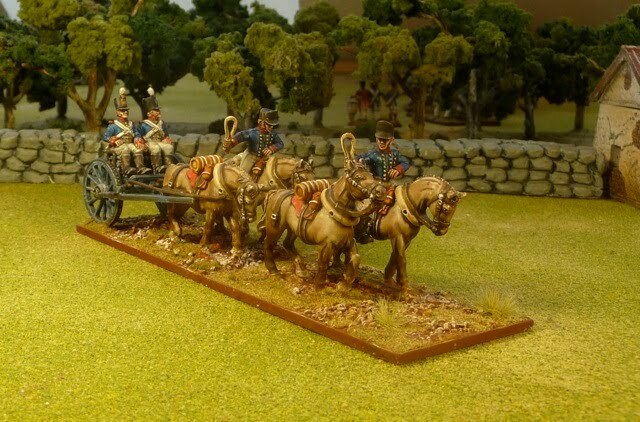 I will eventually add their caisson set as well. This British limber set is also from Front Rank. This is their early period figures. I used Citadel Shadow Grey for the woodwork. I believe now that the actual colour was much more grey than blue grey, but I have multiple cannon already painted so it is a little late. Here is a nice discussion with evidence for the use of grey during the Napoleonic period. I plan to add a third element using the Front Rank British Ammunition Wagon that hooks up to the limber. 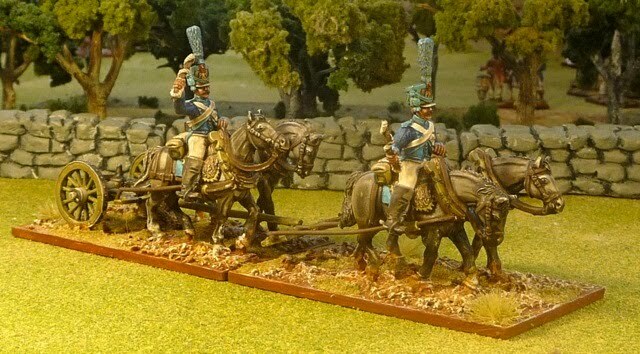 I will probably add 1 to 2 walking figures as I have done with the Prussians below to fill up the base. Since I can not resist Calpe figures, I bought all they had on offer which includes both a limber and caisson set. Their sets come with 6 horses which I find a bit much, so I decided to base the 4 extra horses on 2 bases as free unharnessed horse, I may add some trailing harnesses and possible a single figure, but all for another day. I used Citadel Fenris Grey for the wood work here. I added a couple of walking figures to fill up the space behind the limber. They are an Horse Artillery officer and NCO. Looks ok, I am quite happy with how they came out. I really enjoy seeing limber teams used on the wargame table. They really add to the visual aspect of the game. You have done a nice job of painting and basing the figures. One question - won't the two Prussian standing guys get in the way of the gun when you're in "limbered" mode?? Thanks, I look forward to seeing them on the table. All my cannon are based, so alas we will never see them limbered. I got the inspiration from your limbers! Those look very good, the overall look reminds me of the painting on the Elite Miniatures site by Peter Morbey. Gun teams always look impressive on the table top. Nice limbers and figures! Do you'll use one limber for each gun or one for each battery? 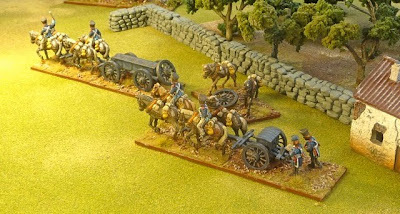 I have no plan to relate the limbers to the cannon, I am using them more for areas of demarcation where infantry and cavalry would be able to maneuver. I will use them when the cannon are in column of march. I confess that I too have a weakness for large horse teams and caissons. I really like what you've done here and I agree that they add to the visual aspect on the tabletop. I find that they can be either purely decorative or symbolic with one limber representing one battery on the move. In larger games or campaigns they can serve a purpose by forming part of the impedimenta of an army. But importantly - they are fun to make and paint up - looking great when they're done!